Welcome to Faces of Easter I: Remembering the Birth and Presentation of Christ in the Temple, the first Sunday lesson for the Lenten season. If the Faces of Easter lessons are new to you, you’ll find that in Godly Play we use the season of Lent to remember Jesus’s life, step by step. In our first lesson of this series, we explore the story of Jesus’s birth. As you retell it in light of the Lenten season, why not also share the story of his presentation in the temple from Luke 2: 22-38? We don’t always share this part of the story and this would be a great time to do so. If your Godly Play story baskets are all displayed in your classroom where the children can see them, I’d encourage you to include the part of the script in which you invite the children to gather one by one anything in the room that reminds them of this part of Jesus’s life, put it around the story tile, and share their thoughts about its connection with the story. As you know, the children can be so creative in this and make connections that we might not even think about. If your materials are not where the children have easy access to them, here are some wondering questions you can ask, in lieu of having the children gather materials that support today’s lesson. 1. I wonder what your favorite part of today’s story is. 2. I wonder what Joseph and Mary did for Jesus when he was a baby to help him grow? 3. I wonder what hopes Mary and Joseph had for Jesus and who he would grow up to be? 4. I wonder what hopes God had for who Jesus would grow up to be? 5. I wonder who else might have helped Jesus grow to be the person God made him to be? The kids could make Jesus from a clothespin and make a manger out of twigs and leaves from a walk outside. Make ornaments of baby Jesus and the pigeons out of felt as seen here. So precious! Or how about these felt doves here? 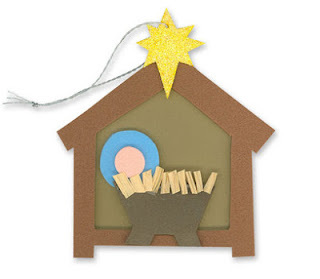 Or they could make the animals in the stable, the shepherds, angels, holy family, or the Magi. Wyline had a great idea of making ornaments by having the children cut out egg shapes out of construction paper and decorating one side like an Easter egg and illustrating the other side with elements from that Sunday’s lesson. As much as you can, let the children come up with how they want to illustrate the story. They’re so much more invested in their work when the whole thing is their idea. want–watercolors, markers, collage, colored pencils, etc. Another idea would be to create three dimensional scenes in your classroom for each week’s lesson. For this week you could bring a baby doll to represent Jesus and have the children figure out how to make a manger to lay him in, maybe make pigeons out of clay for the presentation in the temple. Find material in the resource room for the kids to make a blanket with which to swaddle him. I bet the children can think of other elements for the scene. You could arrange these scenes around the room, making your own version of the stations of the cross!